Cannot update, need help please. Recently I purchased a HTC one M8 after breaking my old phone. So it is second hand and that didn't bother me and figured it might have some issues to work out which was ok by me being interested in IT and general how to on many things. So after working out a few bugs I've come across something I just can't seem to get. It's this update issue I'm having. I read through as much of the forums and I guess I missed it and I'm terribly sorry if there is a common link somewhere for this issue but I'd like to post this pic and ask if someone could please provide me with the details I need to overcome this. Welcome to Android Central! Was this an OTA update, or did you try to install it manually? Thank you, through the phone using home wi-fi. Sorry, what I meant was if the update was pushed over-the-air by HTC or your carrier, or if you downloaded the update manually from the HTC site and installed it yourself? 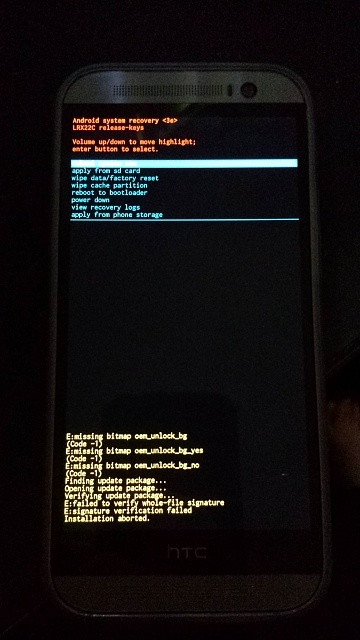 Do you know if your phone is rooted? Try using Root Checker to see. Ok sorry still learning. I had to go to and Settings>about>Software updates to get to the download to start. Nothing is visibly said about who is pushing this out. Root Checker said to me "Sorry! Root access is not properly installed on this device". I can't thank you enough for replying. Try wiping the cache partition, which won't erase any personal data: https://support.t-mobile.com/docs/DOC-10672. Then check for updates again. What carrier was the device on? Have you tried to manually install the ruu? Also I had a problem with an old htc not taking the OTA. Verizon provided me with a replacement device under extended warranty . it would also cover used devices so long as extended warranty is on the line,and in my case,even covers pre existing conditions,but that depends on the state. Some carriers make it so that you can only update the device over their network. I would contact Telstra and see if this is the case here.